It is worth spending money on a good quality practice head, ideally you need 100% human hair. We recommend a medium or high density practice head, with hair no shorter than 12-14 inches. When first starting out, you may find it easier to practice on medium length hair as opposed to long or short. Don’t make things harder for yourself! 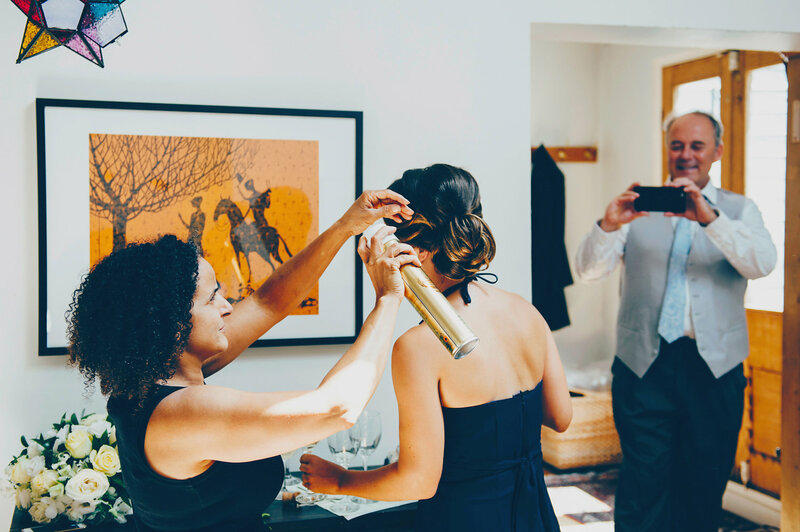 You can work on different lengths later, just practice your bridal hairstyling prep first. Great for gorgeous volume and natural looking, bouncy curls! 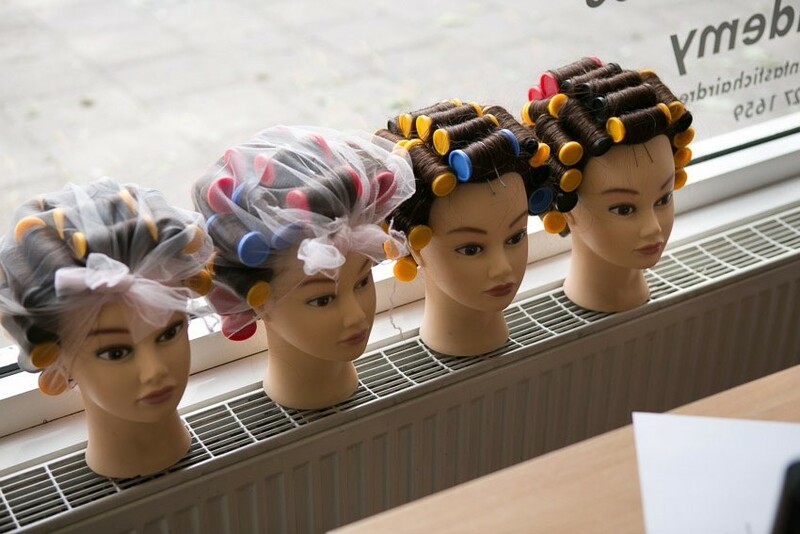 Heated rollers will make life easy, especailly when you’re just starting out. ! If you’re not quite sure how to put them in, don’t worry! We have a full length roller setting tutorial showing you just that. Babyliss Pro are our favourites and the ones we use on all of our bridal hair courses. Create everything from long lasting curls, beachy waves and Hollywood Waves. 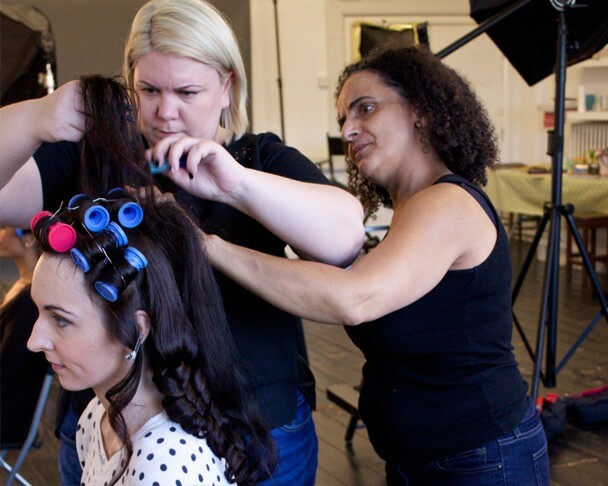 Curling tongs are essential if you’re working with either poker straight, fine or very thick, heavy hair. 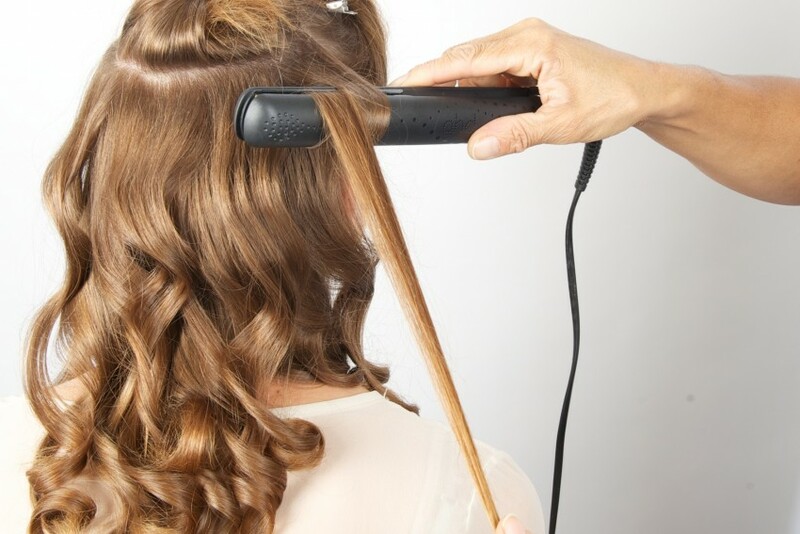 Create beautiful, loose curls quickly and easily with straighteners. Ideal for finishing a half up half down bridal hair-do or a quick fix for last minute hairstyle for the flower girls! Pam loves using GHD’s & Babyliss. These are both good quality and leave hair with a lovely, smooth finish without snagging. It’s a great thing to be able to offer your clients for a glamorous, everyday look. 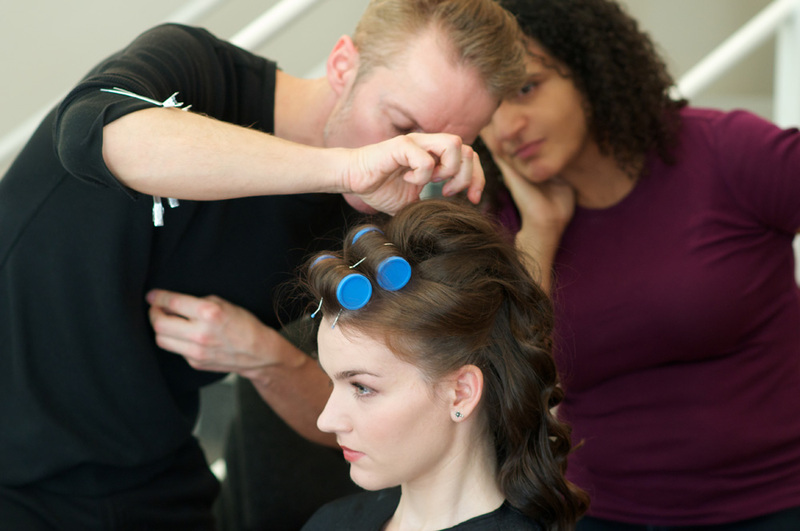 Not only that, but you can also use your hair dryer to set very structured styles and to add finishing touches. 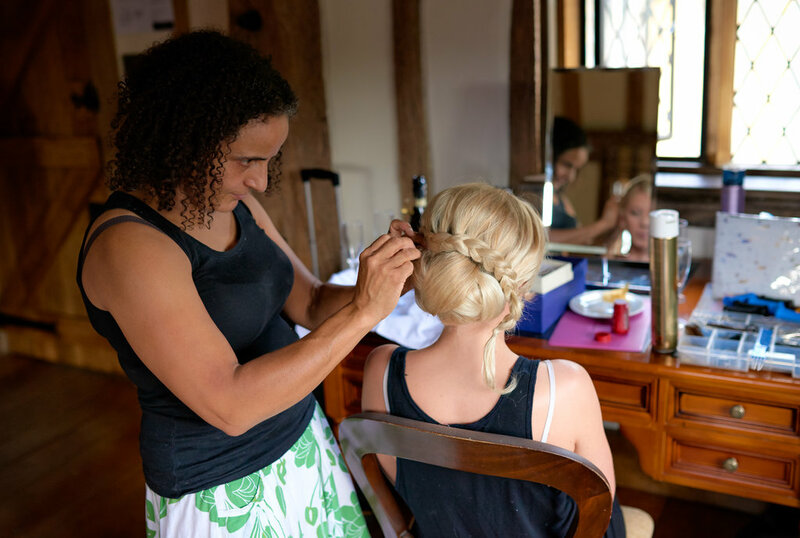 TOP TIP When styling a beautiful, bouncy ponytail, complete the look by wrapping a small section of hairspray drenched hair around the hair-band until it is completely covered. Set with a hair dryer to finish the look! Keep your bridal hairstyles and blowdrys looking smooth and sleek with a good selection of hair brushes. Boar bristle & nylon mix brushes assist with an easy glide through the hair, to help de-tangle without any pulling. You will also need to use your brushes when creating beautiful waves. Once the hair is curled, you can brush slowly from root to tip, guiding with your hand underneath the hair for a perfect finish. Back-combing is a huge part of many bridal hair styles, and being able to do this correctly will not only result in your finished hair style looking fabulous, but it will also enable you to secure your pins and grips correctly to ensure your wedding hairstyles stay put all day and night! Curl cream – We love L’Oreal Liss Control and TIGI Catwalk Curlesque Curls Rock Amplifier – great for smoothing out slightly more stubborn curls! Texturising Powder – Great for adding texture, volume and body to the hair. Dust It by Schwarzkopf is the best one we’ve found. Please note! It doesn’t work well on dark hair as it can make it look a bit ashy or grey. Get Label.M Brunette Resurrection Style Dust for use on dark hair. Hair spray – You’ll need a hair spray that brushes out easily – it should be flexible on the hair so you can try different looks easily. We recommend Elnett Professional Hair Spray – regular hold – available at most beauty wholesalers. Also try Osis Session 3 – a great dry hair spray that is super strong but not heavy. It is good as a finishing spray. Avoid regular Elnett available at most chemists and supermarkets as it can be quite wet and has a tendency to make the hair crispy. Setting Lotions – Schwarzkopf Silhouette style & care lotion and Schwarzkopf Silhouette setting lotion. Mousse – a medium or firm hold mouse. 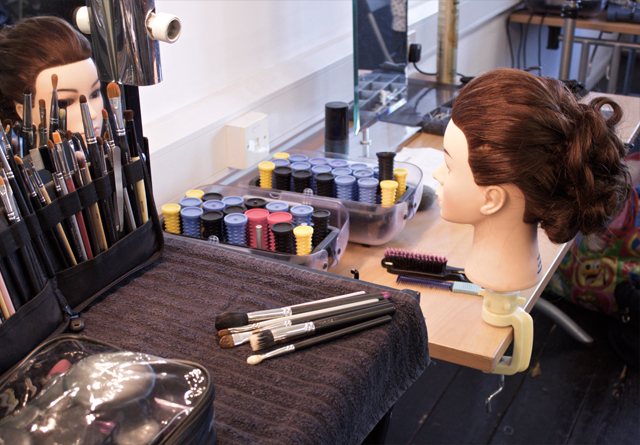 This may seem like an odd one, but staying well organised will make your life as a pro hairstylist so much easier! 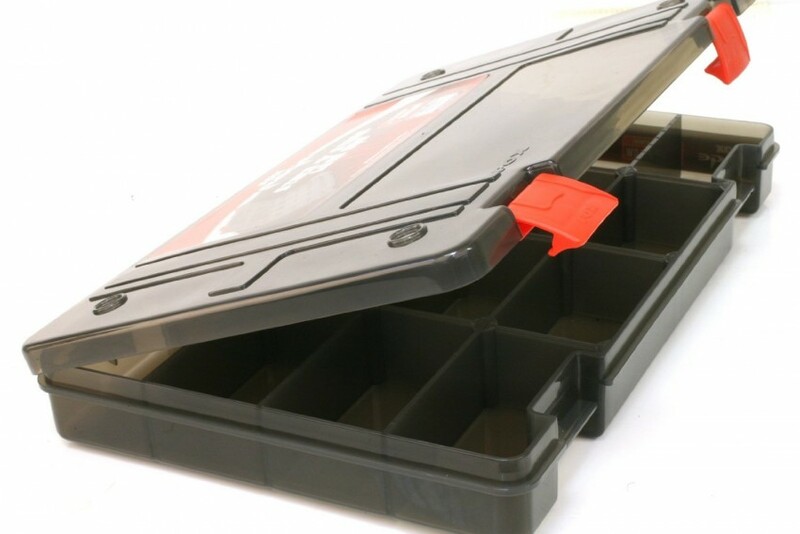 The best one is the large / shallow size available at numerous fishing tackle suppliers online.